This week we are interviewing Richard Thompson, an entrepreneur and business leader with an enviable portfolio. 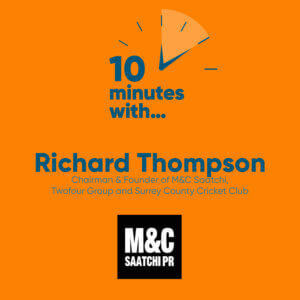 Richard is the founder and chairman of talent management agency M&C Saatchi Merlin and M&C Saatchi Talent Group; chairman of Twofour Group, the UK’s largest independent TV production company; and chairman of Surrey County Cricket Club, the 2018 county champions. Richard left school at 16 and set up his first business at 19, a computer sales group. Ten years later, he set up EMS, which he turned into a £25m sales and marketing agency before selling to Mosaic Group. In 2003, he changed direction, setting up a talent management agency, Merlin Elite, for leading names in sport and entertainment, eventually selling a 60% stake to M & C Saatchi in 2013. The agency represents sporting icons, such as Freddie Flintoff, Sir Matthew Pinsent, Sir Bradley Wiggins and Dame Katherine Grainger, together with stars from the world of entertainment, including Pixie Lott and David Gandy. Meanwhile, M & C Saatchi Social works with a pool of influencers who have more than 26 million subscribers, matching them with leading brands. As Chairman of Surrey, Richard has presided over a dramatic turnaround in the county’s fortunes both on and off the field. Seven of the Championship-winning team were graduates of the Surrey Academy, a unique conveyer belt of homegrown talent; meanwhile, the club announced record £3.6m profits last year and is planning a £50m redevelopment of the Kia Oval.